Socialism is on the rise in the U.S. thanks in part to Senator Bernie Sanders’ recent run for president and the spotlight he put on the once-taboo word. 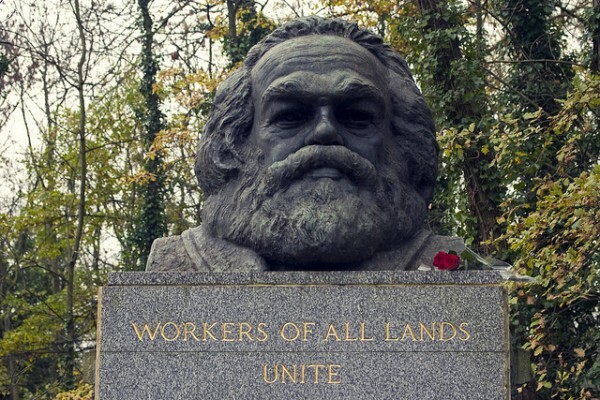 Now, thanks to a new survey of 2,300 people conducted by YouGov and the Washington, D.C.-based Victims of Communism Memorial Foundation, we know that young adults referred to as millennials in this study, agree more with the words of Karl Marx than they do with passages from the bible. The study also shows, in my opinion, that millennials are more educated about what communism and socialism is. They are not stuck behind red scare, McCarthyist views of the USSR or Cuba. They instead seem to be more educated on the topic. 57 percent of Americans overall say they have a “very unfavorable” view of Communism, only 37 percent of millennials said the same. The study also found that 45 percent of those aged 16 to 20 said they would vote for a Socialist, and 21 percent said they would vote for a Communist. Only 42 percent of young adults had a favorable view capitalism. Ironically, the study was meant to shed a negative light on communism and socialism and wishes to imply that Stalin, Castro, and Mao are communist leaders instead of looking at the authoritarian systems they created they don’t meet even the basic necessities of communism laid out by Marx. The truth is, these young adults likely do understand it and realize it’s not socialism or communism. They are happy to work towards a system that actually helps all of its citizens rather than continue to try and fix a broken capitalist system that they understand only helps the wealthy.